View a sample of our multi-family projects below. Click on an image to enlarge and show more detail. The proposed project will Split the lot into two separate parcels leaving the apartment building on parcel 1 with a simple balcony addition and paving modifications. Parcel 2 will be completely redeveloped into 8 condominium units above a parking podium. These units range from 1,650 to 1,750 sq. ft. with 3 bedrooms each. These new units will maintain the traditional feel of the neighborhood while bringing a slightly fresh and more modern quality to a developing area and changing demographic. 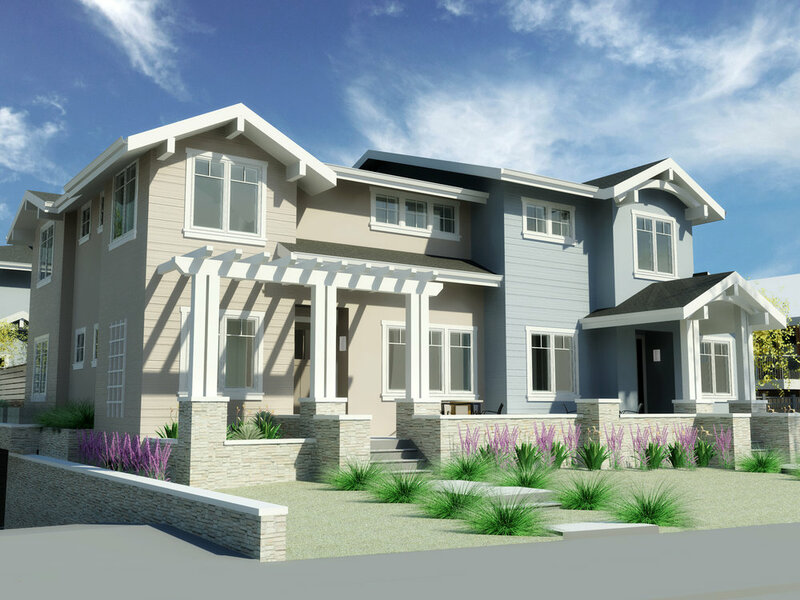 Traditional uses of stone and stucco will be paired with more contemporary wood siding and metal accents and will maintain a somewhat subtle color palette to seamlessly blend with the surrounding neighborhood. While efforts are being taken to keep with the traditional character of the neighborhood, modern methods of sustainability will be thoroughly utilized and integrated during construction. Demolition of 2-story concrete commercial building, 1-story single family residence & garage and 1-story multi-family residence building. We will combine & merge the lots to create a single lot and construct new 4 story multi-family structure with 1 story of underground parking. The new structure will be four (4) stories and step down to a two (2) story facade. Bicycle parking: 30 total bicycle parking bay(s) including 6 guest bay(s) at street. We will demolish existing structures and combine lots (36,705 SF) to create a complex of four new multi-family rowhouse buildings with a large courtyard and internal streets for a total of 14 new units. There are nine four-bedroom units, four three-bedroom units, and one two-bedroom unit ranging from 2,000 SF to 2,600 SF. All parking is provided at grade, with residential parking in private garages and guest parking is adjacent the shared courtyard. The paths between units converge in a large, sunny south-facing shared courtyard which blends an ample lawn area for play with a covered BBQ and picnic area for residents to socialize. Demolition of existing structures & 6 heritage trees and construct 8 new three-story condominiums with one floor of underground parking including a community garden.